Good contact flows so seamlessly that the horse feels as if he is on a long rein. What can possibly go wrong? Trainers all seem to train it differently. Words like vibrate and jiggle are common. I lose rhythm just saying them, much less trying to figure out what they mean on a rein. Some trainers just go for the quick and dirty answer: Pull and kick even harder. It’s a choice; either see the horse get his face jerked erratically or watch your client get so frustrated that they can’t remember their name. Contact is the biggest challenge that most of my clients struggle with. Every trainer is different, every rider is different, and then each horse is a unique sentient being. In the end, their opinion of your contact is the only one that counts. It’s easy to tell if your contact isn’t working. Your hands inhibit your horse, more than him striding from behind pushes him on. When you think of it that way, it’s a loss of balance between the hind and the poll. No pulling a horse back to the bit, you have to let him go forward to the bit. It’s just one more of the counter intuitive things about riding and the list is long! Does your brain hurt yet? Once you understand the semi-technical things, like closed fingers and thumbs up and how to adjust reins, then you have to empty your over-thinking mind and just ride it. Nothing kills rhythm like thinking about the next time to clap along with the beat of the music. It’s time to stop counting and start dancing. It isn’t hard to pull up a mental image of a horse gliding forward at liberty with a gently arched neck, an unrestricted poll, and fluid movement. 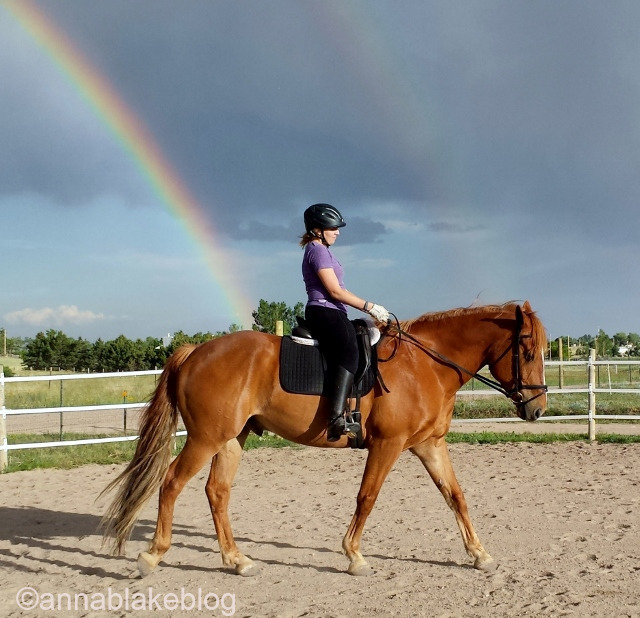 In order to get that beauty under saddle, a rider has to flow with his horse seamlessly. She can not pull against him and disturb the rhythm, she must find a way to release with his movement. Connecting in that rhythm is when riding looks easy. Which is a totally different thing than simple. Remember, most of all, in dressage we never bump a bit against the horse’s mouth. Never become complacent. Even a gentle bit is metal on bone (read here.) Period. We want the horse to embrace that connection with us, so the bit is never, not-ever-even-once, used for punishment. Other riding disciplines do, but we don’t. It is one of the things that sets us apart and we need to take some pride in that. No matter how frustrated it makes us. There are no shortage of techniques but in the end, it’s about feel. Oh, great. More abstractions when all a rider wants is a direct action that works every time. When your brain is thick, dragged down with words and theories and severe effort, his steps drag. The forced techniques run together so much that your hands rebel from their own wrists and all you can do is pull. His trot feels like dragging a box of rocks and a canter would be impossible to launch as a school bus from a slingshot… then just ride. Move forward, drop the reins, and feel him striding under you. Forward -with freedom and elasticity- just like the dressage test reads. Let him carry you, just ride. When you pick up the reins again, breath in art and exhale freedom. There is an art to holding hands, too. Have you held hands with someone who has more tension in their arm than rhythm, someone who carries your hand just a bit high, or pushes the swing past a natural place or goes from fluid to abrupt in a disturbing stride? It’s the tense pull of your mother’s hand when you were little and in trouble. The teenage angst-filled hand of your first date. Or it’s the hand that moves and flows so fluidly that the two of you move unified in a rhythm that balances tides and moon phases. A rhythm as slow and still as a primeval swamp and as weightless as a glide to the moon. Contact is like holding hands with someone you are so comfortable with that there’s overlap where they begin and you end. It happens when minds and hearts are swept away an effortless beat of rhythm. Contact is the place between individuals where respect and love embrace. Good contact is moving forward through space without gravity or dependence on anything more concrete than the flow of movement that is oneness. Love, love, love this post. Am forwarding it to a fellow rider since you are saying so clearly what I have tried to explain in many discussions. Thank you! Lovely expressive way of describing riding on contact! Thank you both. I had a great trainer years and years ago who taught me how to feel in the saddle. The credit goes to Karen. My Aikido (a martial art) instructor describes contact as like having a baby bird between you and your partner. A good connection should feel like the baby bird won’t escape but you also won’t crush it – just enough to “listen” with your body. That’s what I’ve been trying for in my rein contact. Heheh! Listen to that Aikido advice. I have a T’ai Chi history and am forever pulling riders off to do Push Hands. It is just harder to describe than holding hands. Thanks for the comment, and I think you are right about contact. This is why I get so frustrated with dressage. Over here in Germany (where people claim to have an old and successful riding tradition) you are still taught to kick and pull. Or at least to hold tight and drive with your legs. I think: If my horse is not willingly able to bend his poll and shape up, there is a problem with his balance – that I will not solve by pulling and shortening the reins. Nadja, I think this is the age old difference of opinion about training. We see it in most riding disciplines and we forget that a partnership begins by permission and not constraint. On the other hand, the other method works, or they wouldn’t use it. As old as yin and yang. They work for those who decide to be blind. I know and see very few people who are actually able to have an harmonious partnership training like this. I am a 73 year old male who fell madly in love with an abused mare who was on her way to the auction. She was a serious bucker. We adopted her and I spent the first year dragging her around to different trainers who all told me that she would always be a dangerous horse and that I should let her go. I had no experience as a trainer and it had been over 35 years since I had been on the back of a horse and that was a well trained cow pony. Thanks to your posts, which I read religiously, some wonderful guides along the way and lots pf patience, I now ride this mare almost daily, weather permitting. I am convinced it was my love and our abundant liberty time we spent together just “being” that got us this far. I am now working very hard to become a better rider to give her clearer signals and to find my seat if that is possible. I probably don’t have 23 years. This post was extremely helpful and hopeful. Thanks for all you do and who you are. Yes, some men do read your posts regularly. Fred, wow, I am so impressed. Thanks for reading my blog, but really, this is all you. With the help of a good mare who finally found a human who could communicate with her. Thank you for saving her, and for letting yourself know her. You are my hero. Really. Thank you so much for this post. It came at just the right time for ME. Anna thanks. I am no hero really. I have just been following my heart. Every day I learn something more about these magnificent animals. But more importantly every day I learn something more about myself. What more could I ask? Just keep writing and I will keep learning. Like following your heart is always an easy or clear path. You and I will just have to keep learning together. Lucky us. When I think how maladroit most of us humans are at physical contact, it’s not surprising how we struggle with our rein contact. It’s definitely an art up there with fine musicianship, creative, manual or sporting dexterity and I love the way you describe it. My husband, who is recovering from a broken collar bone complains continually about people shaking his hannd or slapping him on the shoulder far too hard! Physical delicacy and grace is not a widespread attribute …. What a wonderful comment from Fred above, and your reply. Maladroit. That is the word I was looking for. Merci.